The Bill of Rights Defense Committee and Defending Dissent Foundation (BORDC/DDF) is honored to present the December 2015 Patriot Award to Rasmea Odeh. Rasmea is being recognized for her work organizing immigrant women with the Arab Women’s Committee of the Arab American Action Network. While BORDC/DDF is honoring Rasmea for her organizing of immigrant women, many of our supporters know of Rasmea due to the government’s ongoing persecution of her. In November 2014 Rasmea was convicted of unlawful procurement of immigration, which BORDC/DDF condemned. To understand the political significance of this conviction, one must understand Rasmea’s backstory. Rasmea was born in Lifta in the British mandate of Palestine, but as an infant was forced to flee to the West Bank during the 1947-48 war. She organized for Palestinian rights and against Israeli military occupation until 1969 when she was arrested by the Israeli military. After being tortured, she was coerced into confessing to a crime she did not commit and imprisoned for ten years after being convicted by an Israeli military court. Following her release as part of prisoner swap in 1979, Rasmea testified to the United Nations about the torture she endured. Rasmea immigrated to the United States in 1994 and became a naturalized citizen in 2004. On her immigration form Rasmea was asked if she had ever been convicted of a crime and she did not mention how she was tortured into confessing and convicted in an Israeli military court. However, Rasmea at no point tried to hide this. As a torture survivor, she frequently spoke out about the horrific experience she had endured, including in a documentary film released the same year she applied for naturalized citizenship. Her conviction in an Israeli military court did not become a problem until after an FBI witch-hunt of anti-war activists. As detailed in the Dissent NewsWire, in September 2015 FBI agents raided the homes of anti-war activists as part of an investigation into “material support for terrorism.” No one was charged with anything and it was later revealed the raids stemmed from the scheming of an FBI infiltrator in Minneapolis activists groups. Rasmea was not among the activists raided, but her coworker at the Arab American Action Network, Hatem Abudayyeh, was. It is believed that as a result of this investigation the U.S. government first became aware of Rasmea. The conclusion of Rasmea’s trial served as a testament to the power of the work she did as an organizer. Throughout the trial supporters, including many members of the Arab Women’s Committee, packed the courthouse and demonstrated outside. After her conviction, the judge received dozens of letters from those who worked with Rasmea. These letters came from leaders of civil rights groups, clergy and activists, and members of the Arab Women Committee. Another letter, written by Halima Al-Rashdeh, explained how as an immigrant in a new country she often “miserable and lonely” not having any family or friends that she knew. Although she immigrated to the U.S. with her husband, he would pass away from a heart attack leaving her a single mother of five children. However, her life changed after Rasmea founded the Arab Women’s Committee. 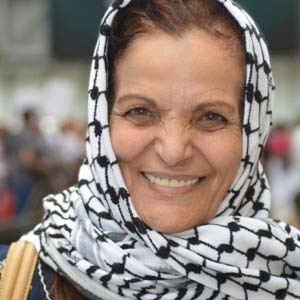 In the committee, Halima found a “safe environment and family atmosphere that is based on understanding and respect.” Of Rasmea, she said “she is amazing, never tiring of giving us all her time, effort, and experience so that we can become empowered as leaders, and meet our personal and community goals.” She explained how Rasmea never judged her for being a single mother, but instead encouraged her to be a strong women. Through the Arab Women’s Committee Halima took English and civics classes, which helped her become a U.S. citizenship. After Rasmea’s conviction, Ramah Kudaimi of the US Campaign to End Israeli Occupation wrote an op-ed explaining what Rasmea’s life had meant to her. She explained how after working with Rasmea at the Arab American Action Network she “wanted to dedicate my life to making the world a better place.” Ramah argued that instead of being imprisoned, Rasmea should be honored. BORDC/DDF agrees with Ramah Kudaimi’s sentiments and that is why we are honoring Rasmea Odeh with the December 2015 Patriot Award.